For those who visit the UAE today, staying in air-conditioned hotels and shopping in ultra-modern malls, the country itself remains an enigma – a glass and concrete creation that seems to have sprung from the desert overnight. Keepers of the Golden Shore looks behind its glossy facade, tracing the traditional tribal bonds of an ancient land to the society of today and casting a new and revealing light on this intriguing, innovative and resilient people. Across the spread of its deserts and mountains, islands and seas, the UAE has a rich and diverse history. From the ancient people who came out of the desert to settle the land, through the invasions and wars these people fought, to the myth of piracy and the mystique of pearls, and the arrival of the oilmen in the stifling heat, Keepers of the Golden Shore tells the extraordinary story of how the Emirates and its ruling families evolved from a tribal society to become one of the richest countries on earth. Michael Quentin Morton grew up in Qatar, Bahrain and Abu Dhabi in the 1950s and ’60s. He has written a number of books on the history of the Middle East, including Buraimi: The Struggle for Power, Influence and Oil in Arabia (2013). 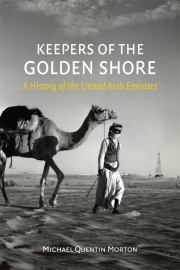 And Keepers of the Golden Shore: A History of the United Arab Emirates (Reaktion, 2016).